In an age when most poster art is computer generated, Razzia is one of the world’s only modern day “poster artist”. During the Golden age of posters, late 1800’s and early 1900’s, before television and certainly computers, advertisers employed the best artists they could find to make interesting and unique renderings of the product they wished to sell or advertise. This was done in order to impact the market and stand out from their competitors with a strong image. In most cases the artist would produce a painting which when approved would be lithographed in a larger size with the appropriate text. Razzia still conceives his posters from an original painting, a technique not common in this day and age. Razzia lives and works outside Paris and has done numerous posters for Louis Vuitton worldwide including the Bagatelle Concours of Elegance and the America’s Cup Challenge. 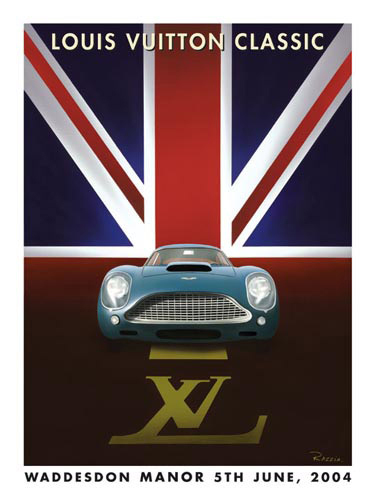 Producing poster images for them established Razzia as an automotive artist to much of his delight as he is an automobile and Formula 1 enthusiast who owns and has owned a few Porsches, Mini Cooper and Triumphs. Since 1985, Razzia has created close to 30 different automobile images for the Louis Vuitton sponsored rallies and Concours d’ Elegance they have organized around the world. Other clients for which he has worked include Stetson hats, Lancia Automobiles, L’Oreal, International Prêt à Porter Feminin (France), Bloomingdale’s, Macy’s in the U.S., Harrods in the U.K., the Nice Jazz Festival, the City of Deauville, several brand name Champagnes and several restaurants in Paris and New York. Among collectors around the world are Elton John, Jackie Collins and Michael Caine. His work has been shown in every major city around the world and is highly collected. Razzia’s Posters embody perfect communication with modern cool in an elegant, crisp style. In his somewhat surreal, stylized brevity we find a technique that is uniquely his own, although ripples of past master can be observed throughout. Cappiello, Erte and Broders are incorporated into Razzia’s works as stylistic touches without resorting to mimicry. I see razzia’s work as divided into two groups. 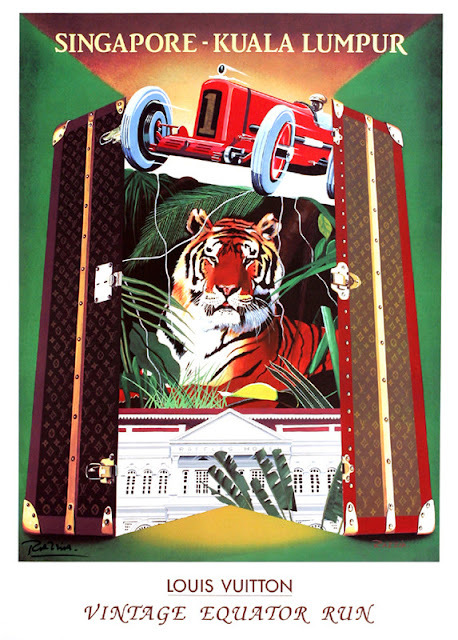 The first is best described as illustrative, with outstanding examples being the Café de Flore and the Bistro du Nord posters, the stetson design and his many Louis Vuitton images. All are persuasive and decorative visions. The second group - in my opinion the most compelling - is comprised of posters that attract viewers with their graphic simplicity and unflinching clarity: images such as the Cigar advertisement, the Pasta poster (without a doubt Razzia’s signature piece), Prêt à Porter, the Deauville swimmer, the Bugatti Atlantic and the Lancia (which I fondly remember also having been hand-painted on the side of a ten-story building off the Périphérique road that encircles Paris). I believe that it is in these bold, concise, focused images that we see the strength and graphic through-line of Razzia’s promotional narrative. But make no mistake about it: Razzia is the last of a dying breed. Quite possibly, he represents a glorious Art Deco conclusion to the contemporary possibilities of the poster. To look at his work is to be mesmerized by his graphic inventiveness and yet one cant quite ignore the fact that in his creations we see the work of the last artist who, at present, can legitimately be called a posterist. Sadly, the poster as a viable marketing tool has been in a steady decline. From magazine and television ads to the advent of internet advertising, it’s not hard to see the writing on the wall. Today’s global firms hire the finest artists and craftsmen to make 30-second commercials; they don’t commission posters to be dispersed with their anachronistic distribution system. And on the odd occasion a poster is actually commissioned by advertisers, instead of hiring a top graphic artist to do the job: they hire a fine-art painter in an effort to produce “arty” promotions. Look no further than the yearly French Open (Roland Garros) posters to understand their irrelevance. But compare these designs with Razzia’s poster for that event in 1984 and you’ll quickly comprehend the opportunities squandered by not utilizing a posterist to create - well, posters. It’s ironic, however, that the popularity of vintage poster art - the true “people’s art” - is reaching an all-time zenith at the exact same time that new poster production appears to be heading the way of the dinosaur. 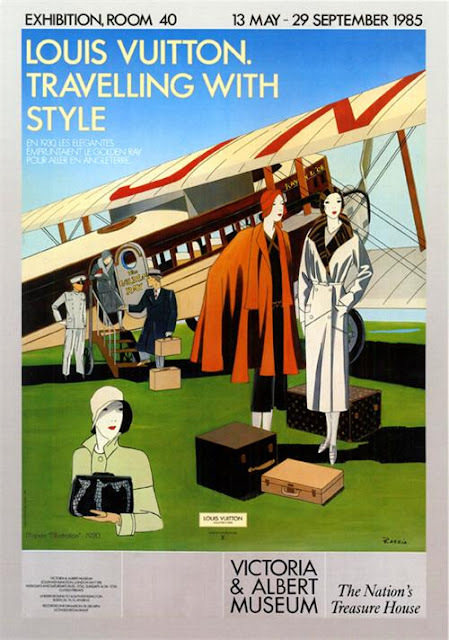 But it’s important to note that rare and vintage posters have achieved this recognition as collectables and decorative items that have nothing to do with the function for which they were originally conceived: widely-disseminated advertising, absolutely necessary for the promotion of products or events. With that in mind, this book serves not only as a testimonial to Razzia’s graphic flair, but also to his tenacity and ability to straddle the precarious line between the artistic and the commercial. Not only did he carve out a posterist’s career by getting important commissions from top companies, he also managed to retain the publishing rights to his designs, reprinting them and marketing them in galleries throughout the world. This is proof of Razzia’s savvy comprehension of the contemporary marketplace, both in terms of a realistic business acumen as well as his adherence to a personal vision. I’ve known Razzia for many years. 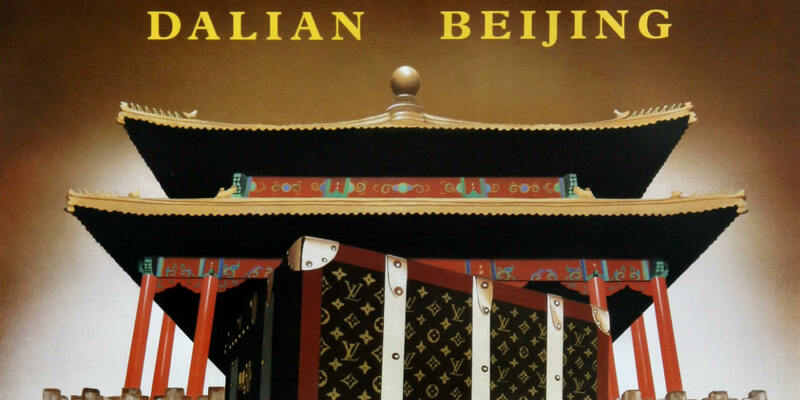 In 1992, I chose him, from a field of renowned worldwide posterists, to create the inaugural poster for my auction enterprise - Poster Auctions International. I also commissioned him to design the poster for my daughter’s wedding. Obviously I was very happy with the results of the artistic endeavors that he undertook on my behalf and I’m pleased that he decided to include them both in this book. Whatever the future holds in store for the poster medium, one ting is perfectly clear: Razzia’s most striking contribution to graphic art is a personal clarity of vision, a playful freshness that hold the eye of the viewer as if it’s the first time that they’ve come across a design - even if that’s far from the truth. And that, without question, is a contribution well worth celebrating. Razzia with an example of his work. We are proud to have been working with Razzia for the last 20 years. 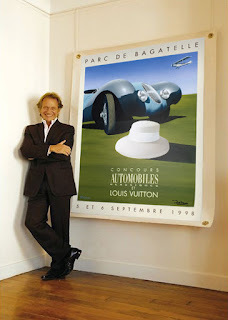 You can see most of his images on our website at www.arteauto.com. 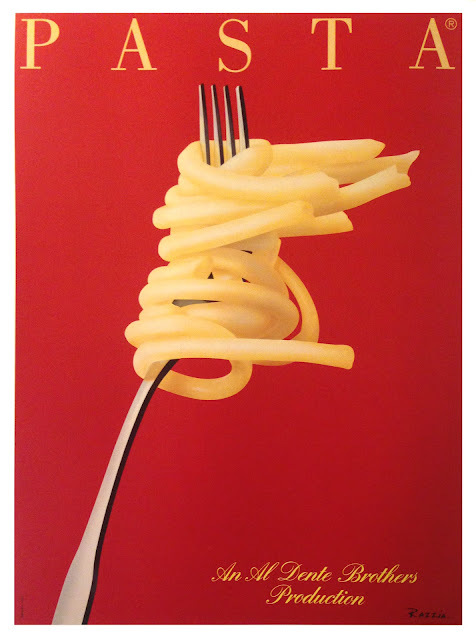 In 2007, with the help of Mickey Ross, Razzia produced a beautiful book; “25 years of Poster art” about his work. It shows his complete production of paintings and posters he has created. Razzia has found his niche by creating compositions which blend perfectly with vintage advertising posters. At l'art et l'automobile, we have always held artists and their work in the highest regard, so much so that we call many of these luminaries friends. Razzia (left) is one of those, and to celebrate a partnership that has lasted for more than 25 years, we have gathered a good selection of our best work by Razzia and are ready to present them to you. 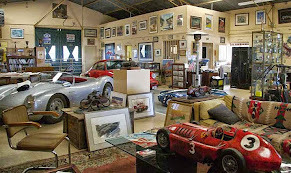 Enjoy looking through the collection and tell us which ones you would like to own. Please Tour the gallery at arteauto.com, and perhaps add a piece to your collection.